This new body of work centers on MEGGS’ recurring aesthetic of duality, which is an ongoing and underlying theme in all of his artwork. The ‘Paving Paradise’ pop up show is a small glimpse into a new focus of his work and features split images depicting natural purity vs. things that represent the decay and downfall of our environmental resources and mankind as a whole. 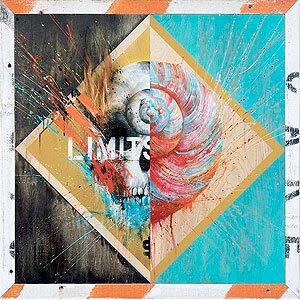 MEGGS intends that his artworks reflect the Yin and Yang, or that two halves make up a whole. Specifically, ‘Paving Paradise’ centers around the duality of human relationships with the natural environment and the man-made, constructed environment. It questions our effect on the planet’s rapidly diminishing natural resources, and where our values lie as living beings on this planet. The series represents the notion that industry and development are approaching a point of no return. By producing too much in terms of development, technology, and material goods, MEGGS conveys that humanity is losing fundamental connections with its natural surroundings and resources, thus losing connections with each other. Overall, this collection references this troubling trade-off. 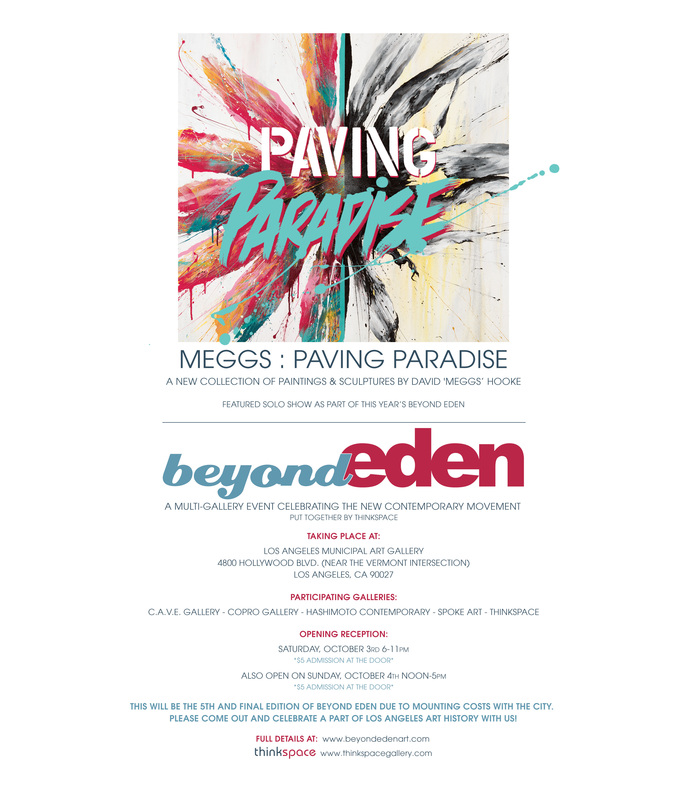 The images featured in the ‘Paving Paradise’ series are iconic, recognizable symbols of nature and development. The traffic cone, for example, is an immediate representation of construction, city life, and urban sprawl. The shell is a perfect example of natural beauty or a natural, beautiful form created by nature. It also is dualistic within itself because it represents the skeleton of nature and can attest to its existence, as well as its decay or death. As he gets older, MEGGS finds himself seeking experiences that revolve around exploring and learning more about his natural surroundings. He considers this pivotal to his personal growth, and is constantly reminded of his responsibility to act sustainably and contribute to the greater good. MEGGS seeks to surround himself with like-minded influencers of positive growth and shift his focus to harnessing the power of his artwork to help spread this consciousness for the greater good of the planet and society.